The Delaware County Medical Examiner has identified the two workers who were killed when an Amtrak train crashed into a backhoe on the tracks near Philadelphia Sunday morning. 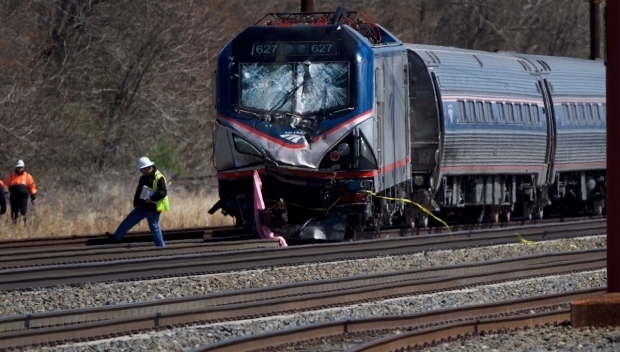 Joseph Carter, Jr., 61, of Wilmington, Delaware, and Peter John Adamovich, 59, of Lincoln University, Pennsylvania, both died from multiple blunt force injuries when a speeding train hit a piece of construction equipment and partially derailed in Chester, Pennsylvania. Carter was a backhoe operator while Adamovich was a worker. The identities of the two victims were released Monday as the National Transportation Safety Board revealed new details in the crash. NTSB official Ryan Frigo said at a news conference that the train was traveling 106 mph in a 110 mph zone and the crash occurred at milepost 15.7, just north of the Booth Street underpass in Chester. The engineer placed the train into emergency mode five seconds before impact, according to officials. Frigo also said "no anomalies" were found after investigators examined the locomotive and passenger cars, along with their maintenance records. Video revealed construction equipment and work train equipment were on the track and immediately adjacent to the Amtrak train's track at the time of the crash. Frigo said investigators have not yet determined who was authorized to be on the track. U.S. Sen. Chuck Schumer, of New York, said before Carter Jr. and Adamovich were identified that he was told the Amtrak employees who were killed both worked for the train system for a long time. Two workers were killed while dozens were injured after an Amtrak train crashed into a backhoe just south of Philadelphia Sunday morning. NBC10's Randy Gyllenhaal has the latest on the investigation. More than 30 passengers were sent to hospitals; their injuries were not considered life-threatening and they were later released, officials said. Before many of the injured Amtrak crash passengers made it to the hospital, they took refuge in a nearby church. NBC10’s Cydney Long has that story. 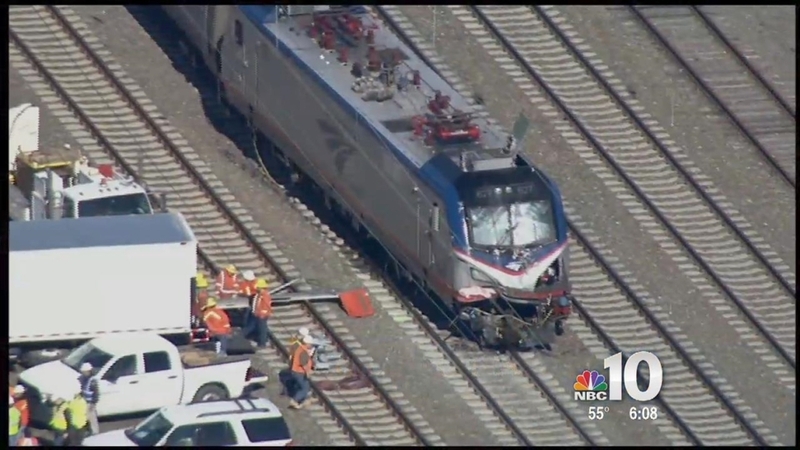 The crash came on a weekend full of accidents, NBC News reported: A man apparently trying to cross tracks near Sacramento was fatally struck by a train, a motorist was killed when a train crashed into a car in Illinois and a pedestrian near Philadelphia lost a leg after being struck by a train. Frigo said at a Sunday news conference the engineer of the derailed locomotive in Pennsylvania was among those taken to hospitals. He said he did not know why the equipment was on a track the train was using. Scheduling, the track structure and the work being performed at the time of the accident would be part of the investigation, he said. 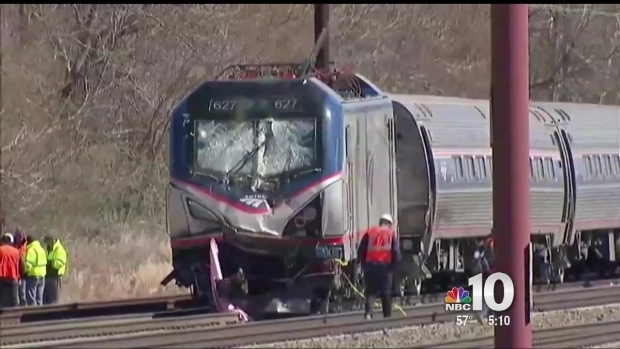 The event data recorder and forward-facing and inward-facing video from the locomotive were recovered, Frigo said Monday, and the recorder was sent to the NTSB laboratory in Washington. Frigo said it determined the train was traveling 106 mph at a location with a 110 mph speed limit. But he said Amtrak has "a 20-step protocol" for having equipment on the tracks and no trains are supposed to go on a track when equipment is present. "Clearly this seems very likely to be human error," Schumer said, calling for Amtrak to review its processes. "There is virtually no excuse for a backhoe to be on an active track." An Amtrak spokeswoman said in an email Sunday to The Associated Press that any information about the type of equipment on the track and why the train was using that track would have to come from the NTSB. "It was a very frightening experience. I'm frankly very glad that I was not on the first car," where there were injuries," Ne'eman said. "The moment that the car stopped, I said Shema, a Jewish prayer. ... 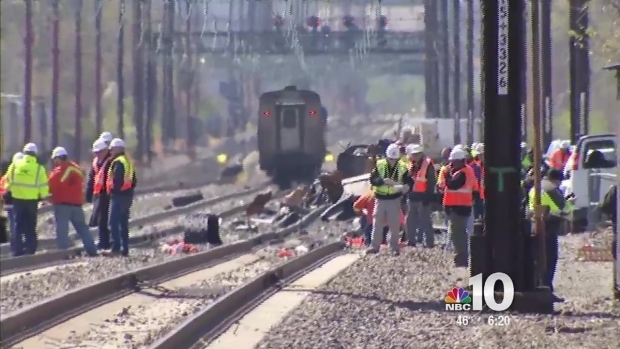 I was just so thankful that the train had come to a stop and we were OK."
NBC10's Drew Smith spoke with passengers who were on board an Amtrak train that crashed into a backhoe just south of Philadelphia Sunday morning, killing two people. Amtrak tried to return to normal Monday after a crash claimed the lives of two veteran workers on Sunday morning. NBC10's Monique Braxton has more. In travel alerts on its website, Amtrak advised that services would resume on the heavily traveled start of the workweek, although commuters would encounter delays on Acela Express, Northeast Regional and other services between Philadelphia and Wilmington, Delaware. Amtrak referred all other questions about the Sunday crash of Train 89 to the National Transportation Safety Board, which is conducting the investigation. Chester officials however did reveal some further details at a Monday news conference including that the engineer was last to leave the train and suffered a leg injury and most of the injured on the train were either carried out by crews or walked to ambulances on their own.